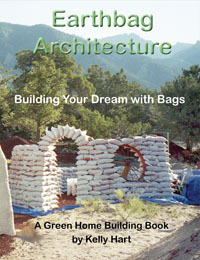 Earthbag building (sometimes called sandbag building) is surely one of the lowest cost, most practical building methods. First used by the military for building durable, bullet and blast resistant structures, this building method has recently experienced a surge of interest among do-it-yourself builders. These structures are safe, quiet, nontoxic, rodent proof, and fire, hurricane and flood resistant. Earthbag building has enormous potential, especially for affordable housing by owner-builders, but it hasn't caught on yet in a big way. Hopefully this article will help bridge the gap. The following instructions assume you have cleared and leveled the site, removed topsoil, positioned fill soil around the building site to minimize work, dug a trench to stable subsoil, and added corner guides and stringlines. In addition, you could make a rubble trench foundation (just add gravel in the trench) before stacking the bags. 1. Tools and materials: woven polypropylene bags (typically about 18" x 30"), tamper, shovel, bucket, sheetmetal slider (about 14" x 24"), 4-point barbed wire, galvanized wire or twine, wire cutters, knife, hammer, tape measure, level, stringlines, corner guides. 2. Fill the bags: use small buckets to measure fill material (use gravel on lower courses); fill approximately 80% full. This technique ensures each bag is the same size, which helps keep each course level. 3. Sew the bags closed: fold the bag end over; use sturdy cord, twine or 20 gauge wire with one end cut at a sharp angle and make about 5 or 6 stitches. This technique facilitates handling, prevents spills, and allows bags to be filled completely. (If money is really tight, this is a good way to save on bags.) Note: Many builders skip this step and simply fold the bag ends under. Both systems work well. 4. Lower courses: place gravel-filled bags (double bagged) working from the corners and openings to the center; align to stringline; tamp the bags solid after the course is complete, working from the center of the bags outward. 5. Add barbed wire: use one or two strands of 4-point barbed wire in-between each course of bags; bricks or stones hold it in place temporarily. 6. Use a sheetmetal slider to place additional courses: after the bag is aligned, hold the end of the bag (it helps to lift the bag slightly) and jerk the slider out. 7. Repeat the process using earth-filled bags, but with a few minor changes: tamp the contents slightly after each bucket load is added; lay full bags in a row flat on the ground alongside the wall; stomp each bag a few times with your foot to flatten it somewhat; swing the bag into place in one motion, with the sewn end jammed against the previous bag; maintain a running bond as in masonry. Note: as the wall gets higher, fill bags directly on the wall to save labor. 8. Make custom-sized bags to fill odd-sized spaces: measure the opening; fill the bag to the approximate level; cut off excess bag material and sew closed (or fold the end over), and place the bag in the wall. The full length article Step-by-Step Earthbag Construction with photos is available here.